This is Irani's second attempt to wrest Amethi from the Congress. In 2014, she lost the seat to Rahul Gandhi by a margin of over one lakh votes. 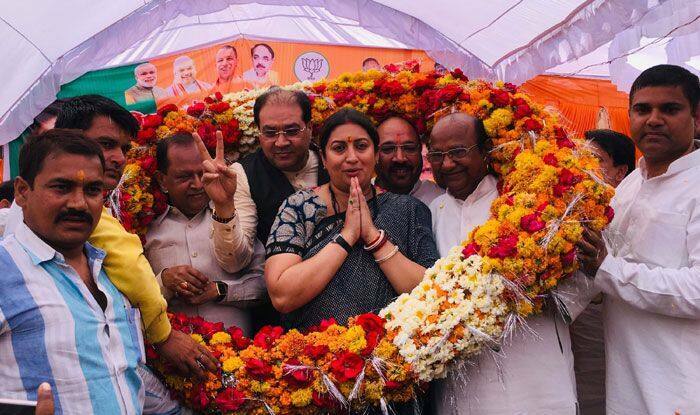 BJP leader Smriti Irani on Friday met several party workers in different assembly segments of the Amethi Lok Sabha constituency, including Tiloi and Jagdishpur, and discussed issues related to the polls. The Union minister, who will take on sitting MP and Congress President Rahul Gandhi, started her door-to-door contact programme from Tiloi. She was accompanied by BJP’s district president Durgesh Tripathi. This is Irani’s second attempt to wrest Amethi from the Congress. In 2014, she lost the seat to Rahul Gandhi by a margin of over one lakh votes.